gain, we see a game where a very strong chess player (the world champion actually!) gave up a pawn for no reason in the position where almost any other reasonable move was sufficient. And just like in the previous game, White could still hold a draw later in the game, but it is beyond the point. It reminds me about my days in the famous Botvinnik-Kasparov school, when the Patriarch would say about a move like this: "Bolsheviks liked to create problems for themselves in order to successfully solve them later." So how did Magnus do it? He didn't set traps for his opponents; instead it is his opponents found a weird way to make their own lives more complicated by giving away pawns for no reason! Should we check Magnus' obligatory orange juice for a trace of "eye of newt and toe of frog, wool of bat and tongue of dog"? Before we do it, let's open an interesting book "Practical Chess Psychology" by Amatzia Avni. In the last two games you can notice identical placement of Black kings, queens and the king's side pawns. Moreover, in all three games a mysterious move of the black king preceded White's blunder. It was similar to a magician who snaps his fingers and the audience falls asleep. Black played Kf8 or Kg7 and White immediately gave away a pawn! Even amateur chess players know that in the bishops of the same color endgames, you are not supposed to put your pawns on the squares of the same color as your bishop, so how could a super GM play 64. a4? and ultimately lose this pawn? It is definitely the hypnosis and the king's move! "I had not seen a path to victory, nor do I see one now; in such a state of mind, a chessplayer must strengthen his position, and pretend as if he has a plan leading to victory. Such an approach will intimidate his adversary and induce errors on his part." 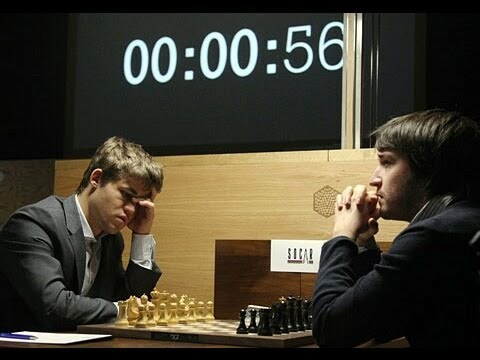 This is exactly what Magnus Carlsen is doing! He is confident, energetic and ready to play for as long as it is necessary to break his opponent's will. Or maybe it is still the magic king moves?